Do you always find it hard to open a can of tuna, sardines or any canned food? If this is always the case, it’s probably taking you long to prepare even just simple dish. There may be lots of reasons why using a can opener is so complicated. First reason: the can opener you’re using is already too old and worn-out. Second, you’re suffering from arthritis and this type of kitchen gadget you’re using doesn’t have soft and easy grip. Meaning, your hand is hurting each time you open even just a single can. And third, the can opener you have may not have quite impressive features and quality that will give you total comfort. If you can relate to the scenarios above, surely, you already want to get out of them. Here’s our good news! Now is the best time to end that difficulty in the kitchen. With our Top 5 Can Openers, you will realize that it’s high time that you replace the one you’re using now whether it’s old or new, still in good condition or worn-out. We listed our Top 5 Can Openers according to their rating on Amazon. The products in this list are affordable and they are easy to use, as well. Above all, our can openers are comfortable to use and have easy grip that guarantees you painless and effortless food preparation. Read on and choose the one that meets your kitchen needs and preferences. The Hamilton Beach Smooth Touch Can Opener is not your ordinary can opener. This is heavy duty in style and function and it is the easiest to use with just one touch operation. Unlike your other twist-and-turn openers, this one’s electrically operated. It may be a bit bulkier and bigger, but this product guarantees to open cans faster than the usual. This high-quality can opener is ideal if you frequently hold parties and events at home. What you’re seeing in this page is a Hamilton Beach product so expect an excellent kitchen tool from it. You can be sure that you’re opting for a bestseller in our No.1 in the Top 5 Can Openers. Since you operate this electrically, you’ll definitely spend sweat-free hours in the kitchen opening numerous canned goods. With such an efficient kitchen tool, there’s no room for panicking and stress while preparing for a big event at home. You’ll even have more time to take a beauty rest before your guests start coming. See: Full Review of the Hamilton Beach Smooth Touch Can Opener. Consider this a perfect can opener with the Good Cook Classic Safe Cut Can Opener especially when you’re looking for something convenient to use. The design of this kitchen tool is not just physically attractive. There’s not need to worry about the possible contamination of food while opening the can. The spinning blade of our No. 2 in the Top 5 Can Openers guarantees not to touch the food. You don’t need special instructions to properly use this food preparation tool. 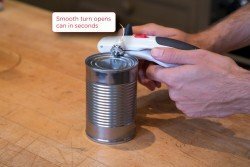 Simply touch the handles gently but carefully, and the handle for the rotating wheel to perfectly cut the can through. See: Full Review of the Good Cook Classic Safe Cut Can Opener. The EZ-DUZ-IT Deluxe Can Opener is from U.S. so, expect it to be a high-quality kitchen item. It is one of the most affordable can openers you can find and yet, it functions as excellent as the high-end and expensive ones in the market. At such a low price, this food preparation tool can be considered as a heavy-duty product. Many people opt for this can opener not just for their own use but for others’ too. Indeed, you can also give this as a gift for any occasion. With easy grip, the user is sure to open cans effortlessly in just a few seconds. This kitchen gadget has a swing design that provides elegance to it. The rubberized handles allows offers you total comfort and convenience even if you’re suffering from arthritis or muscle pain. Cleaning our third in the Top 5 Can Openers is so easy too. Simply hand-wash it with soap and water, and you can already make sure of a clean can opener. See: Full Review of the EZ-DUZ-IT Deluxe Can Opener. The Zyliss Can Opener with Lid Lifter Magnet is a high-quality can opener you can have in your kitchen. This is among the most convenient to use, too. You can open canned products easily without exerting too much effort. With just a little to spend, you can already own a kitchen item that can last for many years. Indeed, this is a lightweight product but it guarantees durability for long-term use. You can also give it as gift for all occasions to people who matter so much to you. If you want to make sure that you’re making the right decision in opting for the No.4 in the Top 5 Can Openers, check out the Amazon page. This can opener is in fact, the #1 Bestseller in the popular site’s can openers category. No more hard times opening a can of sardines, corned beef or meat loaf. So, even if you are in a hurry in the morning, this top-of-the-line can opener won’t give you any delay in your food preparation. See: Full Review of the Zyliss Can Opener with Lid Lifter Magnet. The Arespark Stainless Steel Can Tin Opener is another very reasonable kitchen item you can find on Amazon today. With the features and durability of this product, you wouldn’t believe, it’s that affordable. People who already have this can even compare it with the most expensive can openers they’ve ever had. In fact, they even claim this can opener to be better than the other pricey similar items in the market. Not only that. This top-of-the-line kitchen gadget has an impressive rating too, making it a favorite among many homemakers. This can tin opener has extremely sharp cutting wheel. And, despite the sharpness, it remains safe to use. Flexibility is yet another characteristic you’ll love about the last but definitely not the least in our Top 5 Can Openers. See: Full Review of the Arespark Stainless Steel Can Tin Opener.